I’m really getting into this star shooting and heading out as much as possible to explore different techniques. With this one I arrived about a hour and a half before sunrise and I laid down some shots. I wanted to get away from the spinning star look but I needed detail as the moon had set and there was no real overhead light source. So I took a range of images all the way till sunrise to do a blend. Then finding trying to find the right combination to get a realistic look. So this is my result. Two image blend. Sky and Ground. 20 minutes apart. Good learning experience. The key to all this is the blending of light in the exposures. 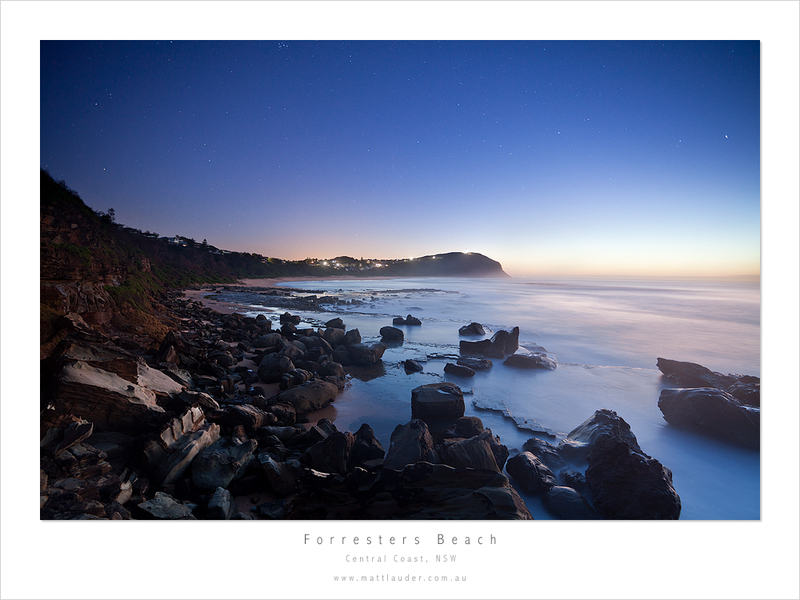 This entry was posted in Uncategorized and tagged blending images, central coast, Forresters Beach, night photography, startrails. Bookmark the permalink. wow, this is great! i like the stars!………..the sky looks like it was tricky to expose for? Love this photo… would love to see it on RubbingPixels!! !